What’s best for the child? There is a restless excitement in the air. It is the last day of school. No, no, not the last day of the year; not even of the term; it’s the last day of the week. It’s a Saturday! The day that follows the week-long rigour of arduous academics and strenuous studies. The day when children feel fully justified to demand ‘Games’. And the day when teachers are caught in the ‘To yield or not to yield’ predicament. The little boys run up to me, “Games, Sir?” they plead in unison, their puppy faces trying to melt my delicate heart. I take a moment to harden myself and blurt out an unconvincing “No”. They throw in a few harsh words to arouse my guilt and continue to argue until they are convinced that they are getting nowhere. They grudgingly take out their textbooks and I gracefully act out my part of showing how interesting the subject is (and eventually, I secretly admit to myself my failure at it). The period ends and with that, the week at school. But what does not end is the dilemma: whom does a teacher please? A part of me feels obliged to please the child. After all, she is the one who has to move from class to class studying this, that and the other, when, actually, left to herself, she would rather run around quite aimlessly (and needless to say, joyfully). And she is the one bonded to intellectual labour, striving hard to know all the things that adults expect her to know merely to satisfy their psychological insecurity. So, to yield to their demand for ‘games’, seems to be the most humane thing for me to do. But a part of me also feels obliged to please the management. After all, it is the management that pays me my salary. So, I have to do what they expect of me which is to ensure the development of the linguistic abilities of the child. Surely this can’t be achieved on the sports field. And also, there is another part of me (and just for your information, if you are wondering, I am made up of countless parts) which feels the need to please the parents. After all, the school is funded by the parents. It is for their children that the school is in existence. In management terms, they are the customers for whom we are the service-providers. Parents are generally pleased when they are assured that teachers are using their time effectively in class. And this is easily conveyed when they find their children’s notebooks filled with elaborate notes. And they are even more pleased when their children score high marks in the exams which again is easily accomplished when the children are skilfully trained for it. But making children copy notes and training them for an exam hardly develops their linguistic abilities! Another teeny-weeny part of me hopes to please myself. After all, having contemplated on the significance of education for more than a decade, I surely have enough ideas of my own that I wish to see actualized. Right from the physical structure of the classroom to the subjects that need to be taught and the methodology to be used, my brain brims with ideas. Above all, this is my life and don’t I need to find some satisfaction in what I do? But that would nurture general intelligence in the child which may not suffice to respond adequately to the challenge of a highly skilled task such as an exam. So there exists innumerable forces, all acting to determine what is good for the child. But all these forces seek their own fulfilment and they also contradict each other. In all this commotion, where is that which is ‘really good for the child’? Can forces that are self-fulfilling, contradictory and conflicting, result in that which is ‘really good for the child’? In the conflict between what ‘I think is good’ versus what ‘the child or the management or the parent thinks is good’, is there any room left to find out ‘what is really good for the child’? 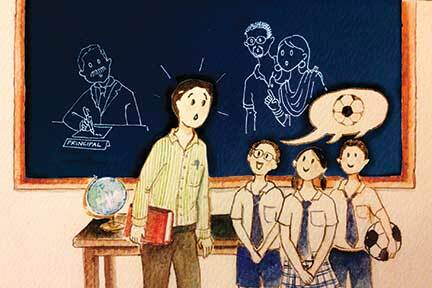 The author is an English teacher at Primrose School, Pondicherry and is deeply interested in education. He can be reached at sundervivek1@gmail.com.